Lyme disease is caused by a spiral-shaped microscopic organism, or spirochete, called Borrelia burgdorferi. This bacterium lives in the gut of the eastern black-legged tick, previously referred to as the deer tick (Ixodes scapularis) and the Western black-legged tick (Ixodes pacificus), and can be transmitted when an infected tick feeds on a dog, person, or other mammal. These ticks are extremely small, ranging from the size of a grain of sand to the size of a sesame seed. Black-legged ticks prefer to hide in shady, moist ground litter, but they can be found above ground, clinging to tall grass, brush, shrubs, and low tree branches. They also inhabit gardens and lawns, particularly at the edges of woodlands and around old stone walls, where deer and white-footed mice, the ticks' preferred hosts, thrive. Lyme disease has been found in every state in the U.S. and some provinces in Canada, likely because pets and animals travel. It is especially regionally important where the tick vectors live, and this area is expanding rapidly. Lyme can affect dogs of all ages, breeds, and sizes. The more time a dog spends outside in areas where ticks are prevalent, the greater the risk! 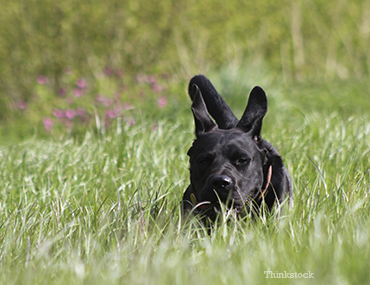 In addition to Lyme disease, dogs are at risk for many other different tick-borne infections. People can also be infected by the same ticks that infect our dogs. If your dog is a tick magnet, make sure you talk to your veterinarian about proper protection. Ticks are not always easy to spot, and it is almost impossible to identify a tick bite—especially if your dog has a thick coat. Symptoms of Lyme disease vary and can be difficult to detect, with warning signs that may not appear until several months after infection. Symptoms of Lyme disease may come and go, vary from mild to severe, and mimic other conditions. In many dogs, the signs may not appear for several months after infection. In severe cases, dogs may also develop heart disease, central nervous system disorders, or often-fatal kidney disease. So let’s talk about the good news. Tests are now available to accurately diagnose your dog for Lyme and other tick-borne infections. If your veterinarian suspects your pooch may have Lyme disease, they will take a thorough history of your dog’s symptoms and activities and recommend testing your dog for Lyme disease, as well as other common tick-borne infections. In some cases, dogs can be coinfected with more than one type of tick-borne organism causing canine ehrlichiosis, canine anaplasmosis, and Rocky Mountain spotted fever. Your veterinarian may recommend additional tests based on your dog's symptoms. Grasp the tick very close to the skin with a pair of fine-tipped tweezers. With a steady motion, pull the tick's body away from the skin. To prevent infection, avoid crushing the tick. After tick removal, clean your dog's skin with soap and warm water. Speak with your veterinarian about opportunities to test the tick before disposal. If choosing disposal, throw the dead tick away with your household trash or flush it down the toilet.